South of Berlin, north of Prague and west of Warsaw, Germany’s eastern reaches are rarely associated with the kind of over-the-top grandeur found at Louis XIV’s Versailles or Peter the Great’s St. Petersburg. But, for 800 years, the lords of Saxony turned Dresden, their capital city, into a dazzling treasure trove. August the Strong, 18th-century Elector of Saxony, filled ornate baroque palaces with thousands of paintings, sculptures and jewels from around the world, including Raphael’s famous “Sistine Madonna.” Along the River Elbe’s verdant banks, August and his court disported themselves at castles like Schloss Wackerbarth in Radebeul, Saxony’s oldest sparkling-wine facility. In Meissen, at Schloss Albrechtsburg, August installed artisans to recreate the secret formula for Chinese porcelain, the era’s “white gold,” and established the famed MEISSEN Manufactory. Destroyed in 1945 by World War II Allied bombing raids, then subjected to nearly 50 years of East German Communist rule, Dresden has made a remarkable comeback. At the 25th anniversary of German Reunification in 2015, with its center-city largely restored, Dresden was, once again, among the Continent’s most splendid cities, the much-beloved “Florence on the Elbe,” offering the finest in European culture along with outdoor pursuits and kid-friendly attractions. Flowing through the city, the River Elbe is usually afloat with long green-and-white paddle wheelers of the Saxon Steamship Company, Europe’s oldest and largest paddleboat fleet. In May, the paddle-steamers assemble for the Parade of the Fleet. 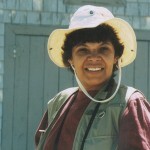 Later, during the International Dixieland Festival, their decks host upwards of 20 jazz bands. The paddle wheelers are also the main event at the Steamer Festival in August. On the Elbe’s left bank rise various baroque and rococo landmarks, including the art-filled Zwinger Palace and Dresden Royal Palace. 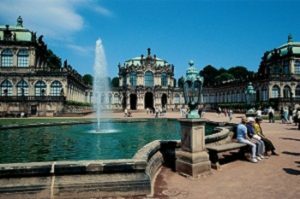 Just east, Dresden’s largest park, the 363-acre Grosser Garten, has its own baroque palace and a little train that winds through the grounds past the Dresden Zoo, Botanical Garden, and Volkswagen Transparent Factory, offering high-tech visitor activities. On the river’s right bank, giant movie screens are installed for summer Film Nights on the Elbe, waterside meadows tempt visitors to linger, and the Elbe Cycle Trail invites riders to discover riverside towns like Meissen, Saxony’s porcelain capital, and Radebeul, home of Schloss Wackerbarth winery. North of Dresden’s center-city, in the Neustadt, or New City, hip bars and music clubs rock well into the wee hours. Arriving in Dresden after a two-hour train ride from Berlin, you’ll find excellent accommodations right in the center-city. Amazingly, a five-star hotel room can be had for $150 or less. 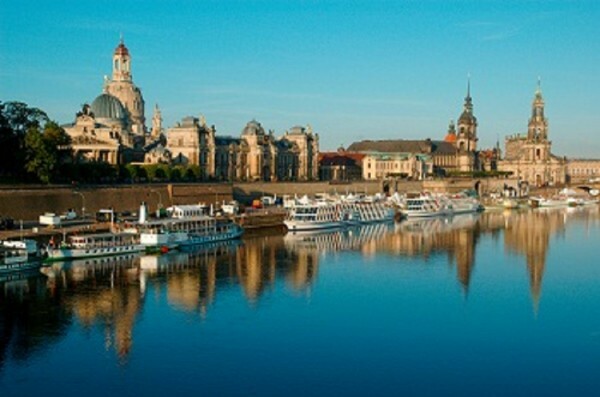 Just book ahead, especially in warm weather, when Germans and other Europeans flock to Dresden. Around the Frauenkirche, on Neumarkt square, are the four-star Steigenberger Hotel de Saxe with 185 rooms, and the five-star Hilton Dresden with eight restaurants, including Bierhaus Dampfschiff for German fare in a riverboat setting, Rossini for Italian food, and the Hot Wok for Vietnamese and Thai food. The four-star Hotel Suitess has 21 rooms and four apartments in elegant 19th-century Biedermeier style. Between the Frauenkirche and Zwinger Palace is the five-star, contemporary-style Swissôtel Dresden Am Schloss. Across from the Zwinger, the five-star Hotel Taschenbergpalais Kempinski is in the ornate yellow-and-white palace that August the Strong built for his favorite mistress, the Countess Cosel. South of Neumarkt Square, on the Altmarkt, where Dresden’s month-long Christmas Market unfolds, you’ll find a four-star NH Collection hotel and several three-star hotels, including a Holiday Inn. In Neustadt, across the River Elbe and north of the city-center, you’ll find other excellent hotels. In the Inner Neustadt, a15-minute walk from the center-city, the four-star, riverside Westin Bellevue Dresden has two restaurants and the city’s largest hotel pool. A five-minute walk east, the five-star Hotel Bülow Palais, a 58-room Relais & Châteaux property, has a one-star Michelin restaurant, Caroussel. Spacious contemporary rooms, with free Wi-Fi, start at less than $100 at the four-star Quality Hotel Plaza Dresden in the Outer Neustadt, 25 minutes north of the center-city and 20 minutes south of Alaunstrasse nightlife by tram. 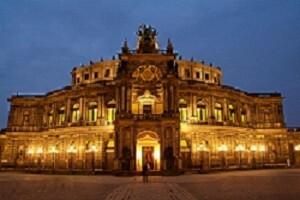 Once settled, head to Dresden’s baroque center-city—and prepare to be dazzled. You can stroll through adjoining squares to all major attractions. Otherwise, hire a licensed guide from Dresden Walks, or join the company’s daily tour, leaving at 12 p.m. from the Schlossplatz. Signs hawk free tours, but, for the real deal, stick with an official guide. Or take the red double-decker hop-on, hop-off Stadtrundfahrt Dresden bus on its 22-stop Grand City Tour. Dresden Welcome Cards, in several versions, offer free museum admission and/or free public transportation. Reduced to a pile of rubble after World War II Allied bombings, the ornate Frauenkirche on Neumarkt square reopened in 2005. Atop its dome, which visitors can climb for panoramic views, rises a gold cross fashioned by the son of one of those British bomber pilots. 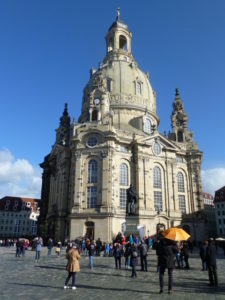 The Frauenkirche is popular for classical concerts, including the spring Dresden Music Festival and the fall Bach series. To hear the 800-year-old Dresdner Kreuzchor, Dresden’s answer to the Vienna Choir Boys, head a few blocks east to the Kreuzkirche for Saturday-night vespers or Sunday-morning services. Steps from the Frauenkirche is the rococo-style Zwinger Palace whose long courtyard, adorned with fountains, statuary and potted orange trees, hosted August the Strong’s garden parties. Today, the palace houses three standout museums. The Dresden Porcelain Collection features August’s own collection of Chinese, Japanese and Meissen porcelain. The Royal Cabinet of Mathematical and Physical Instruments is a treasury of historical clocks, astronomical devices and other instruments. The Gemäldegalerie Alte Meister, or Old Masters Picture Gallery, is a choice collection of paintings from the 15th through 18th centuries. Its crowning glory? Raphael’s “Sistine Madonna,” a large-scale painting of the Madonna and Child, featuring the world’s two most famous cherubs. Another five museums fill nearby Dresden Royal Palace. The historic Green Vault contains 3,000 jewel-studded objects and statuettes in amber, gold and ivory. The New Green Vault has nearly 5,000 diamonds, including the only naturally green diamond ever found. The Collection of Prints, Drawings and Photographs displays more than 500,000 drawings, prints and woodcuts by Old Masters like Albrecht Dürer and Michelangelo, and modern artists like Picasso and Toulouse-Lautrec. The Dresden Armory houses 10,000 items, from suits of armor to riding gear, while its Turkish Chamber contains 600 priceless Ottoman artworks. The Numismatic Cabinet displays nearly 300,000 coins from antiquity to the present. On Theaterplatz, facing the Elbe, is the Semper Opera House, site of the annual Semper Opera Ball and Open-Air Ball in January. Built in 1841 by Gottfried Semper, who also redesigned Vienna’s Ringstrasse, the Opera House has been rebuilt several times, most recently after disastrous 2002 Elbe River floods. Opera buffs can tour the building, and buy online tickets to performances on the same stage where Richard Strauss’ “Der Rosenkavalier” and Richard Wagner’s “Tannhäuser” premiered. Fittingly, on the Semper’s roof, in a chariot drawn by four panthers, is none other than that ultimate lover of the good life, the Greek god Dionysus. Along café-lined Brühl’s Terrace, overlooking the Elbe, the Renaissance Revival-style Albertinum houses the New Masters Gallery. Nearly 250 modernist works were lost during the Nazi campaign against degenerate art, but 3,000 works survived. You’ll see important German paintings by Romantics Caspar David Friedrich and Ludwig Richter, Expressionists Otto Dix, Ernst Ludwig Kirchner and Emil Nolde, and contemporary artists Georg Baselitz and Gerhard Richter. International artists range from Impressionists and Post-Impressionists like Monet and Van Gogh to contemporary artists like Neo Rauch and Luc Tuymans. After museum-hopping, relax over a good meal. At the Sophienkeller, in the Hotel Taschenbergpalais’ vaulted cellars, sample hearty Saxon fare like potato soup with sausages, and sauerbraten with red cabbage and potato dumplings. With tented dining pavilions and buxom serving wenches recalling knightly days, the Sophienkeller is a little touristy. But kids love it, and the food—including light fare like fish and salads—is well prepared. Next to the Frauenkirche, you’ll find the similar Pulver Turm restaurant. Among Dresden’s many fine-dining establishments are three Michelin-starred restaurants, a real coup for such a small city. In the Inner Neustadt, Caroussel, in the Hotel Bülow Palais, serves traditional French cuisine. Farther east is bean&beluga, run by Chef Stefan Hermann, who also owns the well-regarded Restaurant William in downtown’s Schauspielhaus theater. The third Michelin-starred restaurant, in the Outer Neustadt, not far from the Quality Hotel Plaza, is Elements DELI & Restaurant, offering creative German and international cuisine in a high-ceilinged former gas-turbine factory. In the Zwinger Palace, overlooking Theaterplatz’s glittering lights, feast on innovative dishes like pear-and-gorgonzola tartlet, pork fillet with barley risotto and parsnips, and peach panna cotta with hazelnut brittle at Alte Meister. Some cities roll up their sidewalks after dinner—but not Dresden. There are plenty of late-night bars and hotel lounges downtown. Better yet, head to the Outer Neustadt, a 35-minute tram ride away. Along Alaunstrasse and neighboring streets are trendy bars and raucous music clubs, ethnic eateries serving Chinese, Italian, Thai and Turkish cuisine, vegan and vegetarian restaurants, and late-night bakeries and döner-kebab shops. You’ll also find vintage record stores, goldsmith and jewelry shops, second-hand clothing boutiques, and 60s-style head shops displaying colorful Turkish hookahs. Billed as Dresden’s “Alternative Quarter,” Alaunstrasse is a far cry from Dresden’s stately baroque center-city, but the lusty lords of Saxony, passionate practitioners of the good life, would have loved it. For flights, contact German national carriers Air Berlin (www.airberlin.com) and Lufthansa(www.lufthansa.com). For German Rail information, visit www.bahn.com.